1. 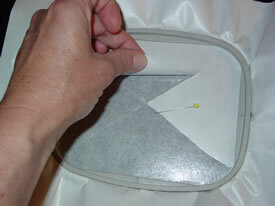 Place one piece of Floriani Perfect Stick in the embroidery frame with the paper side facing up. 2. Draw an "X" on the surface of the paper with a straight pin. 3. 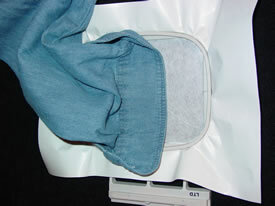 Peel back the paper to expose the sticky surface of the stabilizer. 4. 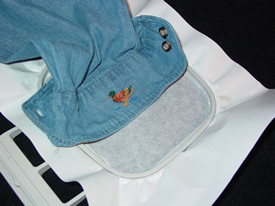 Stick down the item to be embroidered and smooth out any wrinkles. 6. Remove the stabilizer by gently tearing it away from around the design. If the design does not have an outline (this perforates the stabilizer), place your thumb on the edge of the stitching to protect it while pulling away the stabilizer. **Tip - Floriani Perfect Stick is built on a 1.5 oz tearaway stabilizer foundation. 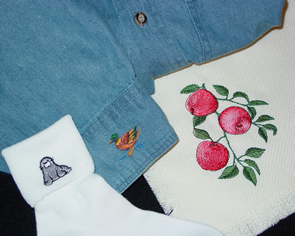 This will support a design around 4" x 4" in size with a stitch count of 10,000 or less. If your design is larger or overly dense for its size you will need to add more stability. 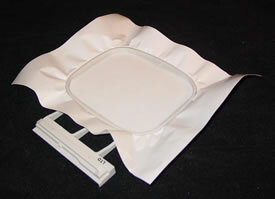 Use one or two layers of Floriani Medium Tearaway as a "floater" under the hoop. 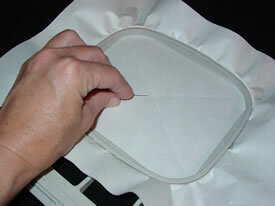 There is no need to baste or use spray adhesive to hold these layers under the hoop, they will simply be caught in the stitching under the fabric.